Speaking a second language isn't always easy. You are constantly second guessing your word choices, and wondering if you phrased something like you would in your first language instead of using the correct idiom. You speak more deliberately, and you often have to plan out what you will say, especially if it's a complex thought or odd grammatical structure. 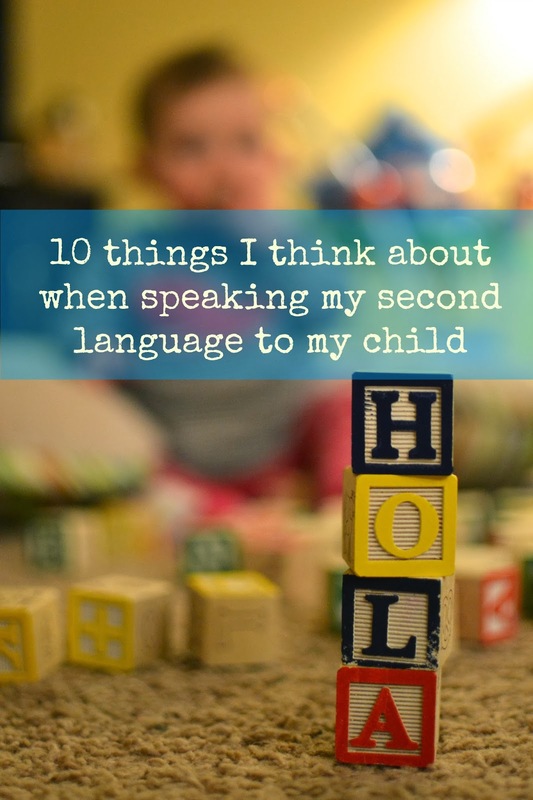 Because of this, committing to speaking your second language to your child comes with it's own set of challenges. Here are some strange thoughts I have throughout the day when I talk to my 8 month old in Spanish that would never cross my mind when speaking to her in English. 2. Crap - what on earth is the word for plum? I know I read it in La Oruga Muy Hambriente (the very hungry caterpillar). Is plum spelled with a b at the end? Why did I think it was spelled with a b? Oh...ciruela. Duh. 3. I keep repeating the same phrases to her. Should I be more descriptive? She's only going to know how to say 5 things in Spanish! 4. Are you kidding me? I have to memorize all the names for baby animals now? 5. How do you tickle someone in Spanish....? 6. Which verb would I use when telling her to go get her toy? Conseguir, obtener, traer...? That doesn't sound right. But what do I know? 7. Ugh. Telling her to be gentle is soooooo much more cumbersome in Spanish than in English. ¡Qué pena! 8. Did I even use subjunctive once today? Unacceptable. 10. I can't believe how much I just learned from that children's song. Completely serious.